The team at one of West Yorkshire’s largest garden centres has introduced an innovative gardening product that will prove timely for midsummer gardeners. 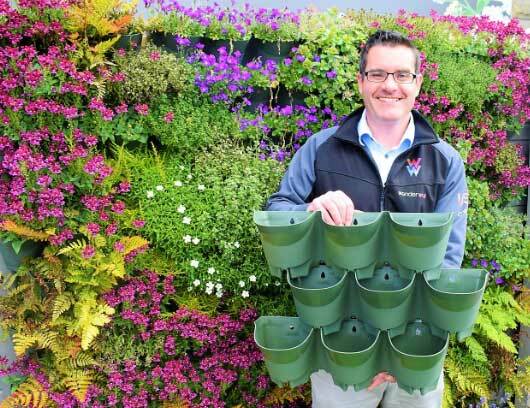 Wonderwall, a self-watering system of interlocking plant pots that are designed for vertical gardening, is now stocked at Tong Garden Centre, the award-winning retail and destination centre in Bradford. The garden centre team are hoping that Wonderwall will prove popular with people interested in creating a vertical garden easily and quickly, said Jo Dales, the marketing manager at Tong Garden Centre. “We’re very pleased to be able to offer customers an exciting and innovative gardening product that will enable them to create a stunning feature wall in next to no time. “Wonderwall is incredibly versatile and can be used to grow everything from herbs and grasses to flowers, ferns and fruit. The fact that it is self-watering is an added convenience to our customers. Already being used in a number of displays at Tong Garden Centre, Wonderwall has been designed by gardening expert Rick McKeever of USP Creations and is made from recycled propene polymer with a three-piece filter layer. Wonderwall costs £12.99 for a three pocket planter, or £9.99 each when five are bought together. Each Wonderwall planter is interlockable and stackable and can be installed on fences, walls, arches and balconies. It is suitable for many plants such as fruits, vegetables, house plants, grasses, succulents, herbs and ferns. For more fantastic DIY plant hanger ideas visit www.designrulz.com.